The children that attend The Ed Foundation's after-school tutoring program at the Port Washington Public Library are all selected on a need basis. Some may have a mild learning disability or behavioral disorder while others have language barriers. The children come to receive extra support with their homework that they may not be receiving at home for various reasons. The 30+ children also arrive from a long ride on the bus, and are wound up and full of exuberant energy. In small groups of 10 students, our teacher Sasha gives the children a positive outlet for their energy and a chance to relax and calm themselves so they can better focus on their learning. Sasha Petukhova has been teaching with United We Om since 2016. She is also one of our Yogis in Residence in 2018, sharing practice with the homeless women and children at MOMMA's House in Hempstead, NY. 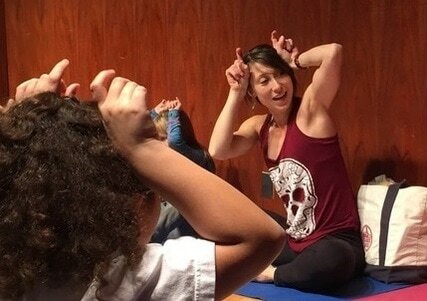 She teaches in studios on Long Island and is Mother to two beautiful children. The Ed. Foundation (formerly the PWEF) is an independent, not-for-profit, community-based organization. Their mission supports educational initiatives that are beyond basic educational requirements. Since, 2001, The Ed. Foundation has actively raised funds and awarded grants to enhance and expand educational opportunities for all students in the Port Washington Public Schools.